Take a ride down the stunning scenic beach of Acapulco and experience a slow-paced, gentle ride down the sandy shores. We welcome beginner and advanced riders alike. Children do not need prior riding experience as long as they are 10 years of age or older. Remember to bring your camera—we will gladly (at no cost) snap photos and take video of your equestrian experience. Also now you can join us on our mission to help the baby turtles survive their trek from the nest to the sea, and ensure that the next generation of beautiful sea turtles is strong and healthy. Our tour will include a visit to the highest point of observation to the bay... The glorious Chapel of Peace. An exciting opportunity to interact with live sea turtles that is only available to a select few people. Acapulco is one of the only places in the world where sea turtles rise from their ocean environment and make their way onto the beach where they will build a nest and lay their eggs. This special place along the beaches of Acapulco is protected by law, but unfortunately natural predators don't know about these laws, and the eggs, nests, and baby sea turtles are subjected to attacks from birds, iguanas and other predators that is way is important that we help them in their way to the ocean. Also get ready to enjoy a great horseback riding adventure tour to a beautiful uncrowded beach. Come with us to this eco adventure and ride a very tame horse. This an ecological ride that will leave you wanting more. We offer you the tamest horses, well fed and kept in good shape. 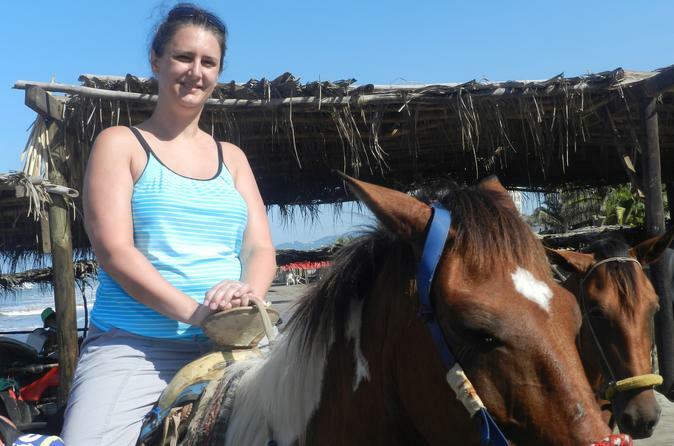 Saddle up and get ready to experience a nice, smooth ride along a beautiful Acapulco Beach! Finally, enjoy stunning views and quiet contemplation at this chapel, perched high above Acapulco and marked by a massive white cross. Be driven up to the actual site to reward yourself with incredible views of the city and surrounding area in a uniquely tranquil setting for a visit that will last no less than 30 minutes You can see the iconic white cross of Capilla de la Paz (Chapel of Peace) from almost anywhere in Acapulco.